Happy 2017! New year, new products! To usher in the new year we are introducing our colorful Metallized Flat Heat Seal Bags. Think single serving coffee bags, though they can be used for granola bars, herbs and much more. They come in red, gold and silver, in a variety of sizes. 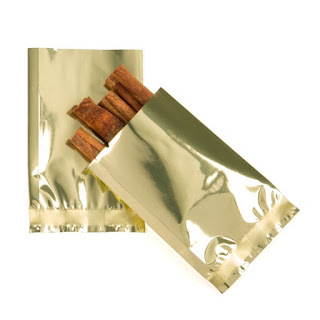 The metallized barrier adds extra protection from light, moisture and air to keep products fresher, longer. Give them a try with an extra 10% off all metallized flat bags through the month of January. If that’s not enough for you, all Stand Up Zipper Pouches and Gussets Bags will be on sale this month too. Get your promo code… You will need it to get the 10% off. Sign up below to get it. Promotion ends January 31, 2017. Discounts only apply to stock items; they do not apply to clearance or custom products. Promo codes cannot be combined. Check out some of these cost effective and irresistible ways you can show off your bling. We’ve organized these tips into bulk, retail, and gift packaging so you can jump to what works best for you. Learn from David Cork about his dynamic kettle corn company and how he uses custom packaging to fit his needs. We know holiday season is over, but it’s never too early to start prepping for next year, right? (Just as long as you don’t start playing Christmas music in January…). Head over to this post for a recap of some great holiday gift ideas. Discounts only apply to stock items; they do not apply to clearance or custom products. Promo codes cannot be combined. 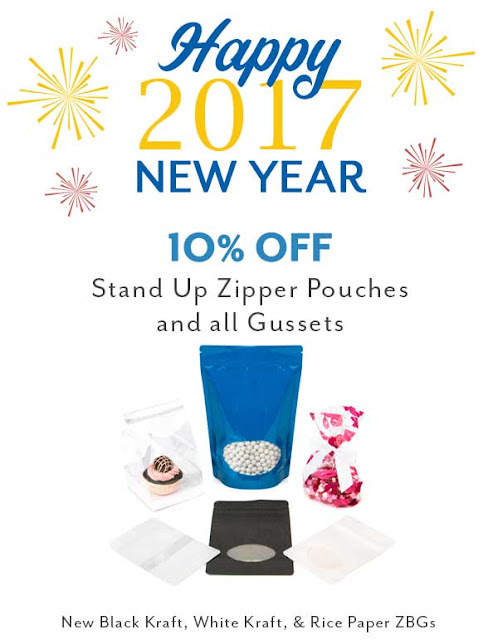 Promo code START2017 includes the following items: All stand up zipper pouches; all gusset bags; and all new metallized flat heat seal bags (Item codes: SMB22QG, SMB22QR, SMB22QS, SMB23R, SMB23S, SMB23SG, SMB3X6QG, SMB3X6QR, SMB3X6QS, SMB412G, SMB412R, SMB412S, SVP28G, SVP28R, SVP28S, SVP34G, SVP34R, SVP34S, SVP35HG, SVP35HR, SVP35HS, SVP38G, SVP38R, SVP38S, SVP44G, SVP44R, SVP44S, SVP46G, SVP46R, SVP46S, SVP57G, SVP57R, SVP57S).